With so many shoes and so little closet space, shoe racks are a great way to organize your footwear. They'll also make it so much easier for you to find exactly the pair of shoes you're looking for in quite a bit less time than it usually takes. There will be no more digging around under the bed to find that left pump when you have five minutes to get to work. No more crawling around in the back corners of your closet to find that stiletto sandal that would be the perfect match to your brand new painting-the-town-red dress, either. Hanging: One of the most common types of hanging shoe racks hangs on the back of a door. You can get metal ones, with prongs to hang your shoes from, or mesh ones with pockets to squirrel away your flats, sneakers, flip-flops or other shoes without too much height. Here is an example of an over-the-door rack that allows you to rest your shoes at an angle instead of hanging them from prongs. Cubes: Cubes are a type of freestanding rack. They don't need a door or wall support to become functional. This type of rack can hold up to fifty pairs of shoes. Here is an example of this type of rack. Freestanding racks: You can buy expandable shoe racks that can be wider or narrower, depending on your space allowances and shoe collection. These often come without a top, so the height of the shoe won't matter. Here's an example of a stackable shoe shelf. This one isn't expandable, but the ones that are typically come in this style. The best type of shoe rack for you depends on what is in your footwear collection. For your chunkier platforms or wedge heels, you're probably not going to be able to hang them up too easily on some racks. Your best bet will be a freestanding rack, preferably one without a top on it, so the heel height won't be an issue. However, for flat shoes and simple pumps, a cube-like rack or even a hanging rack will work just fine. Boots make it tricky. You could forego the shoe racks completely for them, and let them line the wall of your closet, while all your other shoes are hanging on the back of the closet door, or waiting patiently on a freestanding rack. Expandable racks will work best, again with no top. If you decide to store all your other shoes on shoe racks and leave your boots on the closet floor, you may want to check out boot shapers. If you have the room, try an old wooden bookshelf. You can even paint it yourself for a personal touch. Bookshelves could work well in a walk-in closet, or if you just really want to put your shoe collection on display, you can put the shelf out in the open. Rubbermaid containers can work as an alternative to genuine shoe racks, though they won't always offer the best organization. Still, if you're cramped for space you can stash all your shoes in one or a few of them to keep them off the floor and sealed away. If you have limited space, you can also use the Rubbermaid containers to store your seasonal shoes, like sandals until it's time to pull them out again. Buy a small container for each pair of shoes, take a Polaroid of each pair and put the picture on the outside of the box. You can then stack the shoes and not worry about hunting down the right pair. Creative Spaces USA offers hanging and freestanding shoe racks for your convenience. 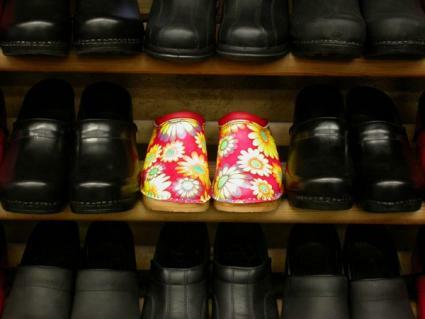 It will be easy to find what you need to accommodate your shoes in the space you have to work with. Design your whole closet--including shoe racks--at Easy Closets.